Did Derby's Bradley Johnson bite Stoke's Joe Allen during their Sky Bet Championship clash on Wednesday evening? 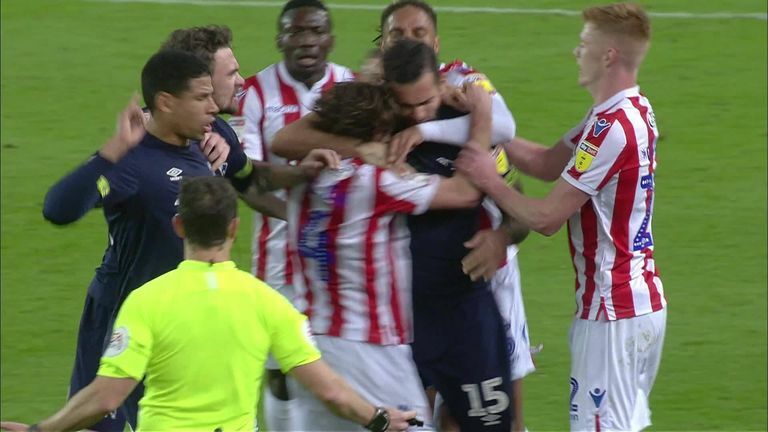 The duo came together during a melee after Stoke's Peter Etebo was sent off in the 33rd minute of the live Sky Sports clash at the bet365 Stadium. TV pictures appear to show Johnson biting Allen, but Stoke boss Gary Rowett insisted at full-time that they would not make any formal complaints. He said: "Someone said originally that Bradley had bit Joe, but I think Joe said it wasn't too bad. Certainly we're not going to have any complaints. "I spoke to the referee, saying it's not a problem and we don't want anything further to be looked at. To me, it was just part of a melee. "Bradley is a great lad and a good professional and I'm pretty sure it wouldn't have been. Joe said it wasn't anything too serious. We won't be making any complaints." Sky Sports expert Liam Rosenior reviewed the pictures at half-time and feels action may be taken against the Derby player. "Once you make a biting action you are opening yourself up to all types of trouble," he said. "I think Bradley Johnson, looking back, will be a bit embarrassed about that. The referee is in a very good position and I'm surprised the referee hasn't seen it. "It's one for the FA to look at retrospectively after the game if that deserves a ban. "Once you bite someone, you are putting yourself and your team in all types of trouble."